Who out there can tell me they don't want to win free money!!!! 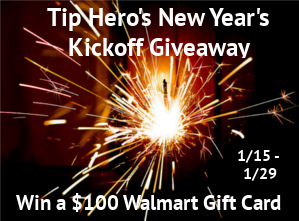 I know you may be thinking this is a giftcard and not money but with walmart you can get just about everything you need! So really its like finding a $100 bill in a pocket of a pair of old pants. Good luck! Disclosure: Life of a Mad Typer is not responsible for prize distribution. If you have any questions or concerns, please send an email to kira@tiphero.com. All entries are optional, but if the winner task is a task that you did not complete, a second winner will be chosen. Winners will be notified via email. If a winner does not respond within 48 hours of the time when the email is sent, another winner will be chosen. I'd love to enter this giveaway but I'm not seeing a PromoSimple form to enter. Form was missing. Issue has been resolved.